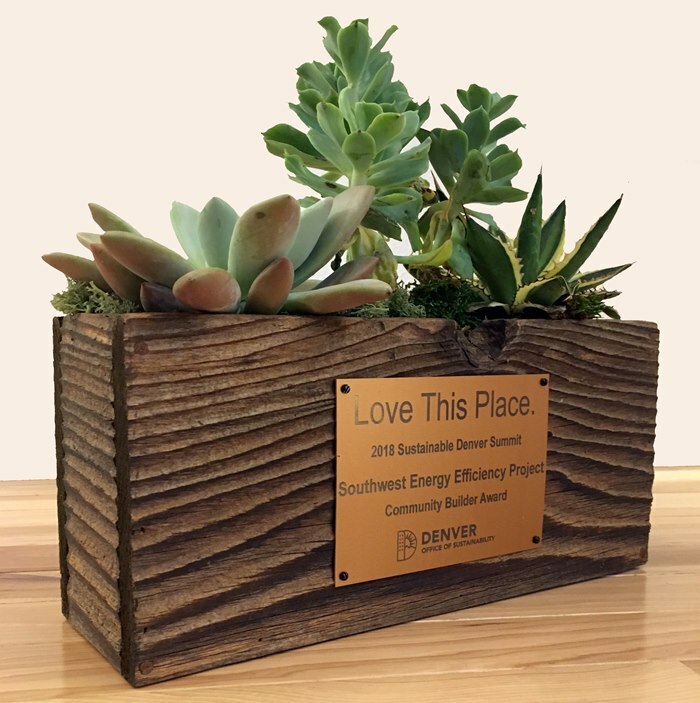 The Southwest Energy Efficiency Project (SWEEP), a nonprofit advancing energy efficiency programs and policies in the Southwest, was honored with a top award from the City and County of Denver for its role as “Community Builder.” The award was presented by the Mayor’s Office of Sustainability at the Sustainable Denver Summit, held November 29, 2018 at the Colorado Convention Center. “SWEEP is very grateful to the City and County of Denver for this recognition and award. It has been great partnering with the city to make increasing energy efficiency a priority within Denver’s energy and climate strategies,” said Howard Geller, Executive Director of SWEEP. The award recognizes SWEEP’s efforts to “bring people and organizations together to achieve results; create common ground and overcome barriers and conflicts; build consensus and seek productive compromise; and work to ensure that all stakeholders are involved,” said Janna West-Heiss, Public Affairs Administrator with the Mayor’s Office of Sustainability, in presenting the award. Whether in city task forces, commissions, advisory groups, public utility dockets, building code hearings, or other multi-stakeholder venues, SWEEP has used its expertise to find climate and energy solutions that are ambitious yet achievable, and innovative yet practical. By encouraging greater use of energy efficiency in Denver’s climate and energy policies, SWEEP ensures that energy bill savings, job creation, increased comfort, improved resiliency and durability, and improved human health go hand-in-hand with climate protection. “We are quite proud of the numerous projects we’ve engaged in with Denver over the years to help advance its sustainability efforts. We look forward to continuing to assist Denver as it works towards achieving its energy and climate goals,” added Geller.